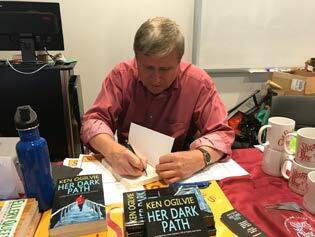 Her Dark Path is Ken Ogilvie’s first published novel. Before taking up mystery writing, Ken worked in a variety of roles in the field of environmental policy, including positions with three governments (Federal, Manitoba and Ontario). He also served as the executive director of Pollution Probe, one of Canada’s premier environmental groups. Ken remains active as a consultant on energy and climate change policy, and serves on the boards of two national nonprofit organizations – the Pembina Institute for Appropriate Development, and Quality Urban Energy Systems of Tomorrow. He is well known across Canada for his environmental work, and has been awarded two honorary doctorates from the University of Waterloo, Ontario, and Thompson Rivers University, British Columbia. Her Dark Path is published by Joffe Books, London, England. It can be purchased as an eBook through Kindle or in paperback from Amazon.ca (or at Amazon.com and Amazon.co.uk). You can also find it in select bookstores in Toronto, including the Sleuth of Baker Street and Book City. Q. Please share with us an “elevator pitch” for Her Dark Path. A. Sixteen years ago, when Rebecca was eight years old, her mother was murdered. The killer has never been caught. Rebecca vowed that one day she would track him down and make him pay. Now a police constable in Ontario, Rebecca wants to become a homicide detective. She gets her first chance on the cold case of a small-town woman who vanished without a trace and was later found strangled in her own home. The crime has similarities to the murder of Rebecca’s mother, and she wonders if the same killer was at work. Q. What drew you into writing a mystery novel? I completed half of a really bad novel, and then struggled over whether to continue with it. I’m not a quitter by nature, so I shelved that effort, took in a deep breath, hit a reset button and started working on a murder mystery. Q. What sources did you draw on for the setting of Her Dark Path? A. My parents grew up on the south shore of Georgian Bay, so I was familiar with that area. While I was young, we lived in some small towns in southwestern Ontario. I used Georgian Bay and my understanding of small-town settings to create the fictional town of Conroy, which I located just off the TransCanada Highway to the east of Georgian Bay. Conroy is a dying town, having once had a thriving sawmill and vibrant community, but when my book opens it is aging badly, is seldom visited by outsiders, and is largely populated by older people. Nondescript Conroy and its vicinity stand in stark contrast to the beautiful rocky, wind-swept shorelines of Georgian Bay, the sparkling lakes of the Muskokas, and the haunting waters of Lake Simcoe. Q. Why did you begin many of the chapters with snippets from the personal diary of Rebecca Bradley, written years before the mystery begins? A. I used the diary entries to provide backstory on the murder of Rebecca’s mother, and to show some of Rebecca’s experiences as she moves into young adulthood. In the opening chapter Rebecca is 24 years old and is working as an Ontario Provincial Police constable. As the only child of a gold-mining magnate in a northern Ontario town, Rebecca grew up lonely and neglected. Her father was obsessed with running his company and spent little time with her. Being the daughter of “Mr. Big” made it difficult for her to make friends, as almost everyone in the town either worked for or depended upon her father. The diary entries help the reader to understand Rebecca and the obstacles she has to overcome as she matures and struggles with her obsession to catch her mother’s killer. Q. How did you research the role of women in today’s police force in creating the character of Rebecca Bradley? A. I searched information on the internet, but I didn’t interview active police women. The book touches on the problems Rebecca encounters with alpha male types, many of whom seem to gravitate to police work; in particular it deals with her conflict with Constable Jack O’Reilly, an aging cop who resides in Conroy, and resents Rebecca coming to “his” town to investigate the cold-case murder. Q. What sources inspired the creation of your main characters, both male and female? A. I purposely moved against the heavy flow of mystery novels that feature older, heavy-drinking detectives having marital and other family problems, and made my protagonist young. I wanted my two main characters to develop and mature over time, and I liked the freshness of writing about younger people responding to events and creating their own futures. In Hound’s case (22 years old), I made him enormous – 6’10” and well over 350 pounds, and gave him an unhappy early childhood in England. He was rejected by his powerful and dodgy father, and shipped off to Canada at ten years of age. Hound is an intelligent but aimless young man when the book opens, and he suffers from an uncontrollably violent temper if he’s pushed too hard. When Rebecca comes to Conroy, where Hound lives, he’s smitten by her. During the book she becomes the catalyst for drawing him out of his shell. Their relationship is an evolving feature of the first book, as well as in subsequent ones in what will be a trilogy. I created supporting characters to mesh with the complicated relationship that develops between Rebecca and Hound, with whom Rebecca feels linked in a sort of kismet, or fate – although for her it’s not romantic – or is it? Several of the secondary characters help to solve the cold-case murder, but Rebecca and Hound are the main sleuths. Her Dark Path also contains subtle hints related to the death of Rebecca’s mother, as well as a few insights into Hound’s mysterious past and character, both of which drive the plots in subsequent books in the trilogy. Q. Thaddeus Hounsely, or Hound, as he is known to the locals, became more and more intriguing to this reader, and to Rebecca Bradley as the mystery developed. Do you intend to use him in another mystery? A. Absolutely! 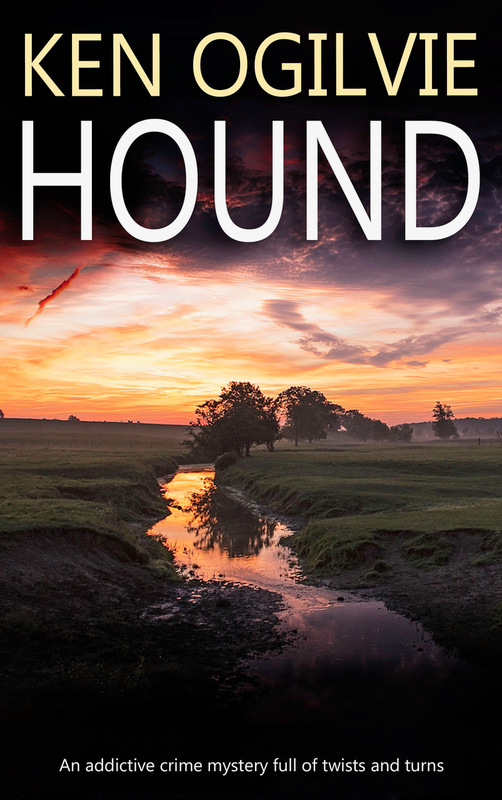 I originally started the book with a male protagonist, self-named Hound, who features prominently in the book, but as I wrote, revised and rewrote the early chapters, it became clear that Rebecca’s was the best voice to work with. In Her Dark Path, Hound is an intriguing character, but when writing primarily from his POV in my earlier version of the novel, I had difficulty sustaining the mystery surrounding him. Fortunately, my Sisters in Crime critique group (currently consisting of Lesley Mang, Terri Dixon and Susan Daly) provided much-needed and appreciated insights into how a young woman in Rebecca’s circumstance might feel and act. So in the final version, Hound is an important secondary protagonist who features prominently, and in subsequent books may become even more dominant. Q. Could you give us some insight into your writing process? A. Friends, family members, external readers and especially my SinC critique group were key contributors to Her Dark Path. I also benefited greatly by having Cheryl Freedman and later, Elaine Freedman, edit early drafts of my manuscript. My initial attempts at writing convinced me that I would have to work hard to master the important elements of creative writing. This is a journey that I have just begun to get my mind around, and it’s one of the delights of writing – I enjoy learning new things and fixing flaws in my books. I’m in awe of the many great writers who are out there, and I welcome the challenge of improving upon my fledgling efforts. I also owe a great debt of gratitude to Joffe Books for taking me onboard and applying expert editing to elevate my book to a publication standard (while teaching me how to improve my writing). My ambition is to make every new book better than the previous one. I don’t know yet whether my writing process will change. I’m a constant self-editor, and I don’t mind going back to revise my book with every new thing that I learn. A. The plot of Her Dark Path became more and more intricate in the telling. Even though I didn’t start out to write a series I see the two story arcs continuing throughout a trilogy. I’m almost finished writing a full draft of the second book, and I’m hoping to get it published by Joffe Books, but that will depend on how well the first book sells; so I’m putting a determined effort into marketing Her Dark Path. Concurrently, I’m working out details of the plot of the final book in the trilogy, and I have started writing the opening chapters. I plan to finish a full draft of that book this year. If time permits, I will also be trying my hand at writing a couple of short stories. Q. What book(s) do you wish YOU had written? A. There are lots of great contemporary authors, but right now I’m digging into past writers and finding them fascinating, including Agatha Christie, Ross (and John) MacDonald, Raymond Chandler, Elmore Leonard, Rex Stout, John Dickson Carr and Dorothy Sayers, among others. As for contemporary writers, I have read a variety of authors to get a feel for how they create their magic. Hopefully, I can take what I learn from past and present writers and use it to develop my own style and voice. A. Because I write mysteries I find myself observing people and their behaviours more closely than in the past. I haven’t been the most observant people-watcher, and I’ve missed many interesting things going on all around me. I’ve come to the conclusion that I need to become a more perceptive and discerning observer if I want to create compelling characters. Fortunately I’ve been lucky to be able to draw on a number of “keen observers” who advise me in this regard. Q. How has being a member of Sisters in Crime influenced you? A. I’ve referred to the importance of SinC in my answers to an earlier question, but I want to add that it is a wonderful organization, comprising loads of gifted writers who go out of their way to help budding authors. I belong to SinC International, as well as the Toronto Chapter, and I’m a “Guppy” who gets a continuous flood of emails from novices posing challenging questions and getting insightful comments from experienced authors. Joining SinC was the best move I’ve made so far in my quest to write mystery books.